Also called frankfurters, frank, weenie, wienie, wiener, dog, and red hot. A hot dog is a cooked sausage that consists of a combination of beef and pork or all beef, which is cured, smoked, and cooked. Hot dogs are among America’s favorite foods. Every year, Americans consume on average 60 hot dogs! 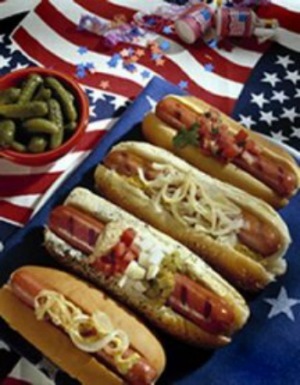 Hot dogs are primarily regarded as a fun, summertime food, and most are eaten between Memorial Day and Labor Day. Seasonings may include coriander, garlic, ground mustard, nutmeg, salt, sugar, and white pepper. 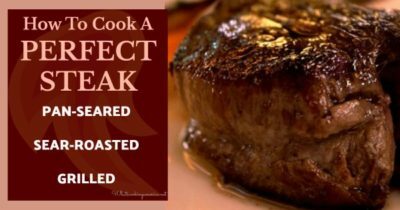 They are fully cooked but are usually served hot. Sizes range from big dinner frankfurters to tiny cocktail size. 64 – Emperor Nero Claudius Caesar’s (54-68) cook, Gaius, is often credited with discovering the first sausage. It was the custom of the time to starve the pigs one week before cooking and eating them. According to legend, one pig was brought out well roasted, but it was noticed that somehow it had not been cleaned. Cook Gaius ran a knife into its belly to see if the pig was fit to eat. To his surprise, out popped the intestines and they were all puffed up and hollow. It was reported that he said, “I have discovered something of great importance.” Gaius stuffed the intestines with ground venison and ground beef mixed with cooked ground wheat and spices. He ties them into sections and the wiener was born. 1690s – Another legend is that the popular sausage (known as “dachshund” or “little-dog” sausage) was created in the late 1600s by Johann Georghehner, a butcher living in Coburg, Germany. It is said that he later traveled to Frankfurt to promote his new product. 1805 – The people of Vienna (Wien), Austria point to the term “wiener” to prove their claim as the birthplace of the hot dog. It is said that the master sausage maker who made the first wiener got his early training in Frankfurt, Germany. He called his sausage the “wiener-frankfurter.” But it was generally known as “wienerwurst.” The wiener comes from Wien (the German name of Vienna) and wurst means sausage in German. In 1987, the city of Frankfurt celebrated the 500th birthday of the hot dog in that city. It is said that the frankfurter was developed there in 1487, five years before Christopher Columbus set sail for the new world. The people of Vienna (Wien), Austria, point to the term “wiener” to prove their claim as the birthplace of the hot dog. 1852 – The butcher’s guild in Frankfurt, Germany introduced a spiced and smoked sausage which was packed in a thin casing and they called it a “frankfurter” after their hometown. The sausage had a slightly curved shape supposedly due to the coaxing of a butcher who had a popular dachshund. The frankfurter was also known as a “dachshund sausage” and this name came with it to America. Also in doubt is who first served the first hot dog! Wieners and frankfurters don’t become hot dogs until someone puts them in a roll or a bun. There are several stories or legends as to how this first happened. As the cuisine of Germany relies heavily upon sausages of all shapes and sizes, it stands to reason that the German people would bring these sausages with them to America. German immigrants appear to have sold hot dogs, along with milk rolls and sauerkraut, from pushcarts in New York City’s Bowery during the 1860s. 1880 – A German peddler, Antonoine Feuchtwanger, sold hot sausages in the streets of St. Louis, Missouri. He would supply white gloves with each purchase so that his customers would not burn their hands while eating the sausage. He saw his profits going down because the customers kept taking the gloves and walking off with them. His wife suggested that he put the sausages in a split bun instead. He reportedly asked his brother-in-law, a baker, for help. The baker improvised long soft rolls that fit the meat, thus inventing the hot dog bun. When he did that, the hot dog was born. He called them red hots. “I devoured hot-dogs in Baltimore ‘way back in 1886, and they were then very far from newfangled….The contained precisely the same rubber, indigestible pseudo-sausages that millions of Americans now eat, and they leaked the same flabby, puerile mustard. Their single point of difference lay in the fact that their covers were honest German Wecke made of wheat-flour baked to crispiness, and not the soggy rolls prevailing today, of ground acorns, plaster-of-Paris, flecks of bath-sponge, and atmospheric air all compact. 1867 – Charles Feltman (1841-1910), a German baker, opened up the first Coney Island hot dog stand in Brooklyn, New York. Some historical accounts say he was a butcher, but according to his great grandson, he was a baker. In order to sell his bakery goods to the men who were building Brooklyn he offered them a hot lunch of a sausage on a bun, thus the beginning of the hot dog.His bakery was located at the corner of 6th Ave and 10th St in Brooklyn. He sold 3,684 sausages in a roll during his first year in business. He is also credited with the idea of the warm bun. I believe the fiction of him being a butcher was started by a competitor. In 1867 Charles Feltman owned a pie-wagon that delivered his freshly baked pies to the inns and lager-beer saloons that lined Coney Island’s beaches. His clients also wanted hot sandwiches to serve to their customers. But his wagon was small and he knew that it would be hard to manage making a variety of sandwiches in a confined space. He thought that perhaps something simple like a hot sausage served on a roll might be the solution. He presented his problem to Donovan, the wheel-wright on East New York and Howard Street in Brooklyn, who had built his pie-wagon. The man saw no problem in building a tin-lined chest to keep the rolls fresh and rigging a small charcoal stove inside to boil sausages. When the wheel-wright finished the installation they fired up the stove for a test run. Donovan thought that the sausage sandwich was a strange idea but he was willing to try it as Feltman boiled the succulent pork sausage and placed between a roll. The wheel-wright tasted the it and liked it. Thus the hot-dog was born. Early 1900s – The hard-working Feltman built a mini-empire at Surf Ave. and 10 street that covered a full city block and consisted of 9 restaurants, a hotel, beer gardens, restaurants, food stands, a bathhouse, a pavillion, a Tyrolean village, and various rides to amuse his customers. The Depression in the 1930’s began the decline of Feltman’s business. Visitors to Coney Island could barely afford the subway ride yet alone a sit down meal at Feltman’s. At his death in 1910, he left a business worth over one million dollars which all started with selling hot dogs. By the 1920s Feltman’s Ocean Pavilion was serving five million customers a year and was billed as the world’s largest restaurant. 1952 – When the restaurant folded in 1954, the Albert family partnership bought the property and leased it out as Feltmans Astro Park. By the time it opened to the public, in the summer of 1962, it had become the space-age Astroland Park. 1915 – Nathan Handwerker (1892-1974), a Jewish immigrant from Poland, went to work for Feltman. Handwerker’s job was slicing hot dog rolls and delivering the franks to the guys who toiled at the grilling stations. It is said that he young lived on free hot dogs and slept on the kitchen floor to save his $11 per week salary. At the end of the year, he’d saved $300 and opened a competing stand–5 cents a hot dog instead of 10 cents. That was the beginning of Nathan’s. It is said that a local singing waiter, Eddie Cantor (1892-1964), comic actor and singer, and his prominent piano accompanist, Jimmy Durante (1893-1980), comedian, piano player, and singer, resented the fact that the prospering Charles Feltman had raised the price on his “franks” to a dime. They suggested to Nathan Handwerker that instead of working for Feltman, that he go into competition with him, selling franks for half the price. Some historians suggest that Nathan Handwerker borrowed $320 from entertainers Eddie Cantor and Jimmy Durante to start the business. To assist in serving his customers, Nathan hired a redheaded teenager, Clara Bowtiinelli (1905-1965), who later was discovered while working there and became the famous actress Clara Bow, the “It Girl” of the 1920’s silent films. The annual Nathan’s Famous Fourth of July Hot Dog Eating Contest on Coney Island has been held at the original Coney Island hot dog stand every Independence Day since 1916. 1893 – The 1893 Chicago World’s Fair, also called the Columbian Exposition, brought thousands of visitors who consumed large quantities of sausage sold by vendors. People liked this food that was easy to eat, convenient, and inexpensive. A frankfurter at Alt Nurnberg cost $.45 ($9.00 in today’s money); whether a bun was included is not known! 1893 – It is claimed that sausages became the standard fare at baseball parks. Some historians claim that Chris Von der Ahe (1851-1913), owner of a St. Louis Bar and the St. Louis Browns major league baseball team, introduced sausages to go with his already popular beer. He was a colorful character himself. A large man who wore loud, checkered clothing, Chris sat in a special box behind third base with a whistle and binoculars. He used the whistle to get the attention of players, for someone to get him a beer, or for special cops he employed for personal use and to keep tabs on his players. He bought the Browns in order to put himself in the limelight and to advertise his saloon business. Historians, to this day, have not found any research to back up the claim that hot dogs were sold at Sportsman’s Park. I have been given credit for introducing the hot dog to America. Well, I don’t deserve it. In fact, at first I couldn’t see the idea. It was my son, Frank, who first got the idea and wanted to try it on one of the early six-day bicycle crowds at Madison Square Garden. I told Frank that the bike fans preferred ham and cheese. He insisted that we try it out for a few days, and at last I consented. His insistence has all Americans eating hot dogs. Famous cartoon artists’ original drawings, many dedicated to the founding father Harry M. Stevens or made especially for him, sold out. Leland’s chairman Joshua Evans spent $1100 for a “frankfurter” courtroom scene cartoon by the famed cartoonist “Tad” Dorgan. Tad coined the immortal phrase “hot dog” when Stevens put the first ball game frank into a roll and rolled out a new tradition. The Stevens family kept the original Tad hot dog cartoon among a small group of memorabilia they hope will be part of their museum effort. TAD wasn’t even employed by the New York Evening Journal in 1902. In 1993, Leonard Zwilling (an editor of the Dictionary of American Regional English) published a TAD lexicon. Zwilling found that the earliest TAD “hot dog” published in the New Madison Square Garden. Not the Polo Grounds. . . TAD was certainly a great cartoonist and slang popularizer/coiner – perhaps America’s greatest. But “hot dog” was in use over ten years before he first used the term in print. 1894 or 1895 – Sausage vendors would sell their wares outside the student dorms at major eastern universities, and their carts became known as “dog wagons.” The name was a sarcastic comment on the source and quality of the meat. This slang term came from the popular belief that dog meat was used in making sausage. Many university magazines, such as Yale, Harvard, Princeton, and Cornell, all show that the term “hot dog” was well know before 1900. The King was so pleased with “this delightful hot-dog sandwich” that he asked Mrs. Roosevelt for another one. Oh dear, oh dear, so many people are worried that the ‘dignity of our country will be imperiled by inviting Royalty to a picnic, particularly a hot dog picnic! My mother-in-law has sent me a letter which begs that she control me in some way. In order to spare my feelings, she has written on the back a little message: “Only one of many such.” She did not know, poor darling, that I have “many such” right here in Washington. Let me assure you, dear readers, that if it is hot there will be no hot dogs, and even if it is cool there will be plenty of other food, and the elder members of the family and the more important guests will be served with due formality. A Confederacy of Dunces, by John Kennedy Toole Random House, 1995. Bull Cook and Authentic Historical Recipes and Practices, by George Leonard Herter & Berthe E. Herter, Herter’s Inc., 1967. Dachsunds, Dog Wagons and Other Important Elements of Hot Dog History, Hot Dog City, National Hot Dog and Sausage Council. Dictionary of 1913 Baseball and Other Lingo, by Gerald Cohen, Rolla, Missouri. University of Missouri-Rolla. Feltman’s & the Hot Dog, Coney Island – Food & Dining, by Jeffrey Stanton. Foods and Drinks at the Pan-American Exposition,Food Firsts and Technological Marvels, The Libraries, University at Buffalo. Coney Island History Project, Hall of Fame: Famous Figures in Coney Island. History Of The Hot Dog, National Hot Dog and Sausage Council. Hot Dog, by Robert Fischer, published by Jullan Messner, 1980. Hot Dog (Polo Grounds myth & original monograph), July 15, 2004, The Big Apple, by Barry Popik. Hot Dogs – Who Cooked That Up, by J. J. Schnebel. Hot Dog! Harry M. Stevens Sports Memorabilia Sold at Leland’s, by Dorothy S. Gelatt, Maine Antique Digest, 1996. Hypotyposeis, Sketches in Biblical Studies, Did the Church Ban Sausages? @ Baraita, by Stephen C. Carlson. National Hotdog & Sausage Council. Panati’s Extraordinary Origins Of Everyday Things, by Charles Panati, Harper & Row, 1987. The Hot Dog Companion, by David Graulich, Lebhar-Friedman Books, 1999. The Life of Symeon the Fool, Leontius’ Life and the Late Antique City, by Leontius of Neapolis, translated by Derek Kreuger, University of California Press, Berkeley, 1995. The Night 2000 Men Came To Dinner, by Douglas G. Meldrum, Charles Schribner’s Sons, 1994. The Royal Visit: June 7-12th, 1939, Franklin D. Roosevelt Presidental Library and Museum. Urban Legends Reference Pages, by Barbara and David P. Mikkelson.